Ancient cultures around the Mediterranean knew that certain objects, such as rods of amber, could be rubbed with cat's fur to attract light objects like feathers. Thales of Miletus made a series of observations on static electricity around 600 BC, from which he believed that friction rendered amber magnetic, in contrast to minerals such as magnetite, which needed no rubbing. Thales was incorrect in believing the attraction was due to a magnetic effect, but later science would prove a link between magnetism and electricity. Electricity would remain little more than an intellectual curiosity for millennia until 1600, when the English scientist William Gilbert made a careful study of electricity and magnetism, distinguishing the lodestone effect from static electricity produced by rubbing amber. He coined the New Latin word electricus ("of amber" or "like amber", from ἤλεκτρον [elektron], the Greek word for "amber") to refer to the property of attracting small objects after being rubbed. This association gave rise to the English words "electric" and "electricity", which made their first appearance in print in Thomas Browne's Pseudodoxia Epidemica of 1646. Early investigators of the 18th century who suspected that the electrical force diminished with distance as the force of gravity did (i.e., as the inverse square of the distance) included Daniel Bernoulli and Alessandro Volta, both of whom measured the force between plates of a capacitor, and Franz Aepinus who supposed the inverse-square law in 1758. Based on experiments with electrically charged spheres, Joseph Priestley of England was among the first to propose that electrical force followed an inverse-square law, similar to Newton's law of universal gravitation. However, he did not generalize or elaborate on this. In 1767, he conjectured that the force between charges varied as the inverse square of the distance. In 1769, Scottish physicist John Robison announced that, according to his measurements, the force of repulsion between two spheres with charges of the same sign varied as x−2.06. In the early 1770s, the dependence of the force between charged bodies upon both distance and charge had already been discovered, but not published, by Henry Cavendish of England. Finally, in 1785, the French physicist Charles-Augustin de Coulomb published his first three reports of electricity and magnetism where he stated his law. This publication was essential to the development of the theory of electromagnetism. He used a torsion balance to study the repulsion and attraction forces of charged particles, and determined that the magnitude of the electric force between two point charges is directly proportional to the product of the charges and inversely proportional to the square of the distance between them. The torsion balance consists of a bar suspended from its middle by a thin fiber. The fiber acts as a very weak torsion spring. 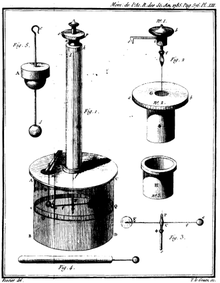 In Coulomb's experiment, the torsion balance was an insulating rod with a metal-coated ball attached to one end, suspended by a silk thread. The ball was charged with a known charge of static electricity, and a second charged ball of the same polarity was brought near it. The two charged balls repelled one another, twisting the fiber through a certain angle, which could be read from a scale on the instrument. By knowing how much force it took to twist the fiber through a given angle, Coulomb was able to calculate the force between the balls and derive his inverse-square proportionality law. The magnitude of the electrostatic force of attraction or repulsion between two point charges is directly proportional to the product of the magnitudes of charges and inversely proportional to the square of the distance between them. The force is along the straight line joining them. If the two charges have the same sign, the electrostatic force between them is repulsive; if they have different signs, the force between them is attractive. where ke is Coulomb's constant (ke = 7009898755178736817♠8.9875517873681764×109 N⋅m2⋅C−2), q1 and q2 are the signed magnitudes of the charges, the scalar r is the distance between the charges, the vector r21 = r1 − r2 is the vectorial distance between the charges, and r̂21 = r21/|r21| (a unit vector pointing from q2 to q1). The vector form of the equation calculates the force F1 applied on q1 by q2. If r12 is used instead, then the effect on q2 can be found. It can be also calculated using Newton's third law: F2 = −F1. When the electromagnetic theory is expressed in the International System of Units, force is measured in newtons, charge in coulombs, and distance in meters. Coulomb's constant is given by ke = 1/4πε0. The constant ε0 is the vacuum electric permittivity (also known as "electric constant")  in C2⋅m−2⋅N−1. It should not be confused with εr, which is the dimensionless relative permittivity of the material in which the charges are immersed, or with their product εa = ε0εr , which is called "absolute permittivity of the material" and is still used in electrical engineering. The SI derived units for the electric field are volts per meter, newtons per coulomb, or tesla meters per second. Atomic units. In atomic units the force is expressed in hartrees per Bohr radius, the charge in terms of the elementary charge, and the distances in terms of the Bohr radius. Electrostatic units or Gaussian units. In electrostatic units and Gaussian units, the unit charge (esu or statcoulomb) is defined in such a way that the Coulomb constant k disappears because it has the value of one and becomes dimensionless. Lorentz–Heaviside units (also called rationalized). In Lorentz–Heaviside units the Coulomb constant is ke = 1/4π and becomes dimensionless. Gaussian units and Lorentz–Heaviside units are both CGS unit systems. Gaussian units are more amenable for microscopic problems such as the electrodynamics of individual electrically charged particles. SI units are more convenient for practical, large-scale phenomena, such as engineeering applications. If two charges have the same sign, the electrostatic force between them is repulsive; if they have different sign, the force between them is attractive. An electric field is a vector field that associates to each point in space the Coulomb force experienced by a test charge. In the simplest case, the field is considered to be generated solely by a single source point charge. The strength and direction of the Coulomb force F on a test charge qt depends on the electric field E that it finds itself in, such that F = qtE. If the field is generated by a positive source point charge q, the direction of the electric field points along lines directed radially outwards from it, i.e. in the direction that a positive point test charge qt would move if placed in the field. For a negative point source charge, the direction is radially inwards. Coulomb's constant is a proportionality factor that appears in Coulomb's law as well as in other electric-related formulas. Denoted ke, it is also called the electric force constant or electrostatic constant, hence the subscript e.
The charges must have a spherically symmetric distribution (e.g. be point charges, or a charged metal sphere). The charges must not overlap (e.g. they must be distinct point charges). The charges must be stationary with respect to each other. The last of these is known as the electrostatic approximation. When movement takes place, Einstein's theory of relativity must be taken into consideration, and a result, an extra factor is introduced, which alters the force produced on the two objects. This extra part of the force is called the magnetic force, and is described by magnetic fields. For slow movement, the magnetic force is minimal and Coulomb's law can still be considered approximately correct, but when the charges are moving more quickly in relation to each other, the full electrodynamic rules (incorporating the magnetic force) must be considered. The derivation makes clear that the force law is only an approximation — it ignores the momentum of the input and output fermion lines, and ignores all quantum corrections (ie. the myriad possible diagrams with internal loops). The Coulomb potential, and its derivation, can be seen as a special case of the Yukawa potential (specifically, the case where the exchanged boson – the photon – has no rest mass). The absolute value of the force F between two point charges q and Q relates to the distance between the point charges and to the simple product of their charges. 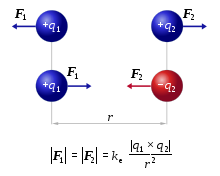 The diagram shows that like charges repel each other, and opposite charges mutually attract. where r is the separation distance and ke is Coulomb's constant. If the product q1q2 is positive, the force between the two charges is repulsive; if the product is negative, the force between them is attractive. In the image, the vector F1 is the force experienced by q1, and the vector F2 is the force experienced by q2. When q1q2 > 0 the forces are repulsive (as in the image) and when q1q2 < 0 the forces are attractive (opposite to the image). The magnitude of the forces will always be equal. where r21 = r1 − r2, the unit vector r̂21 = r21/|r21|, and ε0 is the electric constant. The vector form of Coulomb's law is simply the scalar definition of the law with the direction given by the unit vector, r̂21, parallel with the line from charge q2 to charge q1. If both charges have the same sign (like charges) then the product q1q2 is positive and the direction of the force on q1 is given by r̂21; the charges repel each other. If the charges have opposite signs then the product q1q2 is negative and the direction of the force on q1 is given by −r̂21 = r̂12; the charges attract each other. The electrostatic force F2 experienced by q2, according to Newton's third law, is F2 = −F1. The law of superposition allows Coulomb's law to be extended to include any number of point charges. The force acting on a point charge due to a system of point charges is simply the vector addition of the individual forces acting alone on that point charge due to each one of the charges. The resulting force vector is parallel to the electric field vector at that point, with that point charge removed. where qi and ri are the magnitude and position respectively of the ith charge, R̂i is a unit vector in the direction of Ri = r − ri (a vector pointing from charges qi to q). In this case, the principle of linear superposition is also used. For a continuous charge distribution, an integral over the region containing the charge is equivalent to an infinite summation, treating each infinitesimal element of space as a point charge dq. The distribution of charge is usually linear, surface or volumetric. Experiment to verify Coulomb's law. It is possible to verify Coulomb's law with a simple experiment. Consider two small spheres of mass m and same-sign charge q, hanging from two ropes of negligible mass of length l. The forces acting on each sphere are three: the weight mg, the rope tension T and the electric force F.
In this way, the verification is limited to measuring the distance between the charges and check that the division approximates the theoretical value. Coulomb's law holds even within atoms, correctly describing the force between the positively charged atomic nucleus and each of the negatively charged electrons. This simple law also correctly accounts for the forces that bind atoms together to form molecules and for the forces that bind atoms and molecules together to form solids and liquids. Generally, as the distance between ions increases, the force of attraction, and binding energy, approach zero and ionic bonding is less favorable. As the magnitude of opposing charges increases, energy increases and ionic bonding is more favorable. Wikimedia Commons has media related to Coulomb force. ^ Roller, Duane; Roller, D.H.D. (1954). The development of the concept of electric charge: Electricity from the Greeks to Coulomb. Cambridge, MA: Harvard University Press. p. 79. ^ Socin, Abel (1760). Acta Helvetica Physico-Mathematico-Anatomico-Botanico-Medica (in Latin). 4. Basileae. pp. 224–25. ^ Heilbron, J.L. (1979). Electricity in the 17th and 18th Centuries: A Study of Early Modern Physics. Los Angeles, California: University of California Press. pp. 460–462 and 464 (including footnote 44). ISBN 978-0486406886. ^ Schofield, Robert E. (1997). The Enlightenment of Joseph Priestley: A Study of his Life and Work from 1733 to 1773. University Park: Pennsylvania State University Press. pp. 144–56. ISBN 978-0-271-01662-7. ^ Priestley, Joseph (1767). The History and Present State of Electricity, with Original Experiments. London, England. p. 732. ^ Elliott, Robert S. (1999). Electromagnetics: History, Theory, and Applications. ISBN 978-0-7803-5384-8. ^ Robison, John (1822). Murray, John (ed.). A System of Mechanical Philosophy. 4. London, England. The result of the whole was, that the mutual repulsion of two spheres, electrified positively or negatively, was very nearly in the inverse proportion of the squares of the distances of their centres, or rather in a proportion somewhat greater, approaching to x−2.06. When the experiments were repeated with balls having opposite electricities, and which therefore attracted each other, the results were not altogether so regular and a few irregularities amounted to ​1⁄6 of the whole; but these anomalies were as often on one side of the medium as on the other. This series of experiments gave a result which deviated as little as the former (or rather less) from the inverse duplicate ratio of the distances; but the deviation was in defect as the other was in excess. We therefore think that it may be concluded, that the action between two spheres is exactly in the inverse duplicate ratio of the distance of their centres, and that this difference between the observed attractions and repulsions is owing to some unperceived cause in the form of the experiment. Therefore we may conclude, that the law of electric attraction and repulsion is similar to that of gravitation, and that each of those forces diminishes in the same proportion that the square of the distance between the particles increases. ^ Maxwell, James Clerk, ed. (1967) . "Experiments on Electricity: Experimental determination of the law of electric force.". The Electrical Researches of the Honourable Henry Cavendish... (1st ed.). Cambridge, England: Cambridge University Press. pp. 104–113. We may therefore conclude that the electric attraction and repulsion must be inversely as some power of the distance between that of the 2 + ​1⁄50 th and that of the 2 − ​1⁄50 th, and there is no reason to think that it differs at all from the inverse duplicate ratio. Translation: It follows therefore from these three tests, that the repulsive force that the two balls — [that were] electrified with the same kind of electricity — exert on each other, follows the inverse proportion of the square of the distance. Coulomb also showed that oppositely charged bodies obey an inverse-square law of attraction. Huray, Paul G. (2010). Maxwell's equations. Hoboken, NJ: Wiley. ISBN 0470542764. Jackson, J. D. (1999) . Classical Electrodynamics (3rd ed.). New York: Wiley. ISBN 978-0-471-30932-1. OCLC 318176085. Purcell, Edward M.; Morin, David J. (2013). Electricity and Magnetism (3rd ed.). Cambridge University Press. ISBN 9781107014022. Walker, Jearl; Halliday, David; Resnick, Robert (2014). Fundamentals of physics (10th ed.). Hoboken, NJ: Wiley. ISBN 9781118230732. OCLC 950235056. Coulomb, Charles Augustin (1788) . "Troisième mémoire sur l'électricité et le magnétisme". Histoire de l’Académie Royale des Sciences. Imprimerie Royale. pp. 612–638. Griffiths, David J. (1999). Introduction to Electrodynamics (3rd ed.). Prentice Hall. ISBN 978-0-13-805326-0. Tamm, Igor E. (1979) . Fundamentals of the Theory of Electricity (9th ed.). Moscow: Mir. pp. 23–27. Tipler, Paul A.; Mosca, Gene (2008). Physics for Scientists and Engineers (6th ed.). New York: W. H. Freeman and Company. ISBN 978-0-7167-8964-2. LCCN 2007010418. Electric Charges, Polarization, Electric Force, Coulomb's Law Walter Lewin, 8.02 Electricity and Magnetism, Spring 2002: Lecture 1 (video). MIT OpenCourseWare. License: Creative Commons Attribution-Noncommercial-Share Alike. This page was last edited on 24 April 2019, at 18:09 (UTC).